Last week, we previewed Chomp, a new service that aims to offer a better review and recommendation system for iPhone apps. Today, the service, which is an app itself, has gone live, with its app now available in the App Store. As we noted, the service is sort of like a Yelp for iPhone apps. But what makes it work is that it’s simple and intuitive. When you load up Chomp, you’re taken to a screen with just four main options: Live App Reviews, Recommendations, Add People, and Bookmarked Apps. 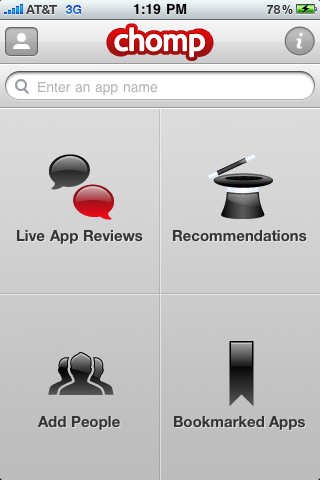 As you might imagine, the Live App Reviews are is a stream of new app reviews coming in, in realtime. 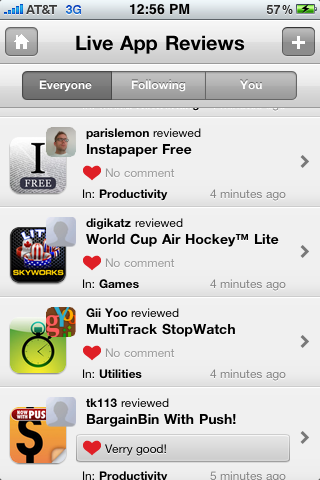 Recommendations give you a list of apps to download based on the apps you’ve already reviewed. Add People gives you an easy way to connect with others on the service using your real friends on Facebook, “App Celebrities” (high profile users), and top app reviewers. Bookmarked Apps is obviously a way for you to note apps that you may want to download later. There are a number of both web-based and iPhone apps out there now doing these types of recommendations. There’s an obvious need for this with well over 100,000 apps now in the App Store. But Chomp is the most intuitive ones I’ve tried yet. And its recommendations already seem to beat the pants off of the App Store’s built-in app recommendation engine. Chomp co-founder Cathy Edwards (also Chomp’s CTO) single-handedly wrote the app recommendation technology which they call AppRank, co-founder Ben Keighran tells us. And the simple Chomp app reviews definitely seem like a better approach than the App Store arbitrary 5 star system, with reviews that are most of the time just spam, or useless. To help spread word about the app, Chomp has enlisted Digg founder Kevin Rose as one of its first App Celebrities. They’re also hoping to get heavy users tweeting about the service to help spread it virally. Find Chomp in the App Store here. It’s as free download.